Top shelf in the world of burger making - Wyebrook Ground Beef and Bacon, special. The Red Cat cheese - a brined, stinky cow's milk cheese, a perfect compliment to the bacon and fennel. 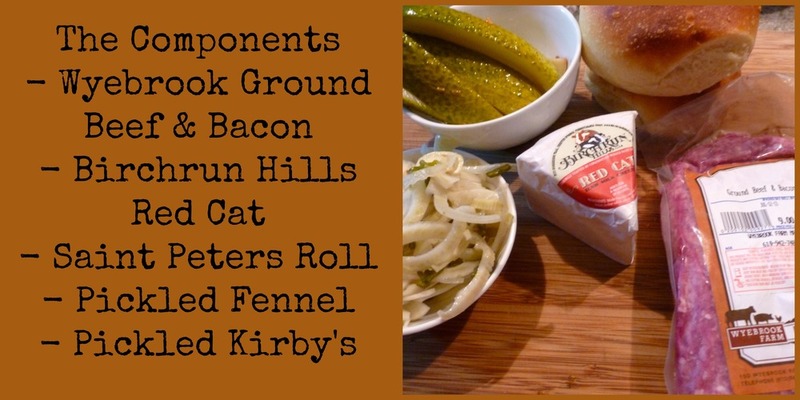 This is easy: 1. make the burger patties, grill over a medium flame to avoid flair-ups 2. apply cheese, melt 3. toast rolls on grill 4. place burger on toasted bun 5. top with pickled fennel 6. place your homemade pickled kirby on the side. Perfection! No condiments! Just enjoy the flavor of the ingredients! To drink - Victory Beer, of course!